For some enzymes, dynamics on the millisecond timescale play a critical role in catalysis. I don’t think this is a particularly controversial or unclear statement, but then, I know what I mean by it. In the process of communication, however, the intended meaning sometimes gets lost or transformed. A statement that addresses an entire catalytic cycle, for instance, might be interpreted as addressing only the chemical step. This seems to have happened in a pair of papers that concern the transfer of energy from conformational rearrangements to a chemical reaction. Pisliakov et al. (1) ask whether the closing process can accelerate kchem. They ask this question primarily because a group from Harvard University proposed that this was possible in a paper printed last year in J. Phys. Chem. B (2). In that paper, Min et al. performed some simulations suggesting that such an acceleration was at least possible, and consistent with some enzymatic data. Pisliakov et al. approach the question with simulations of the reaction of the phosphotransfer enzyme Adk with 2 ADP molecules to form ATP and AMP. As part of the catalytic cycle, the enzyme goes from an open state (PDB: 4AKE) where the ATP and AMP binding sites are exposed to solvent, to a closed state (PDB: 1ANK) where the substrates are shielded from the surrounding solution by ATP and AMP “lids” that close down over the active site. One can, perhaps, imagine that when the enzyme closes around the substrates, some motion will occur that promotes the transfer of a phosphate group from one molecule to another. Pisliakov et al. use a three-tiered system of simulations to address the question, as a way of trying to get around the difficulty of dealing with the long timescales required. Their simulations allow them to adjust the energy barrier to match the experimental rates or accelerate the reaction so that the whole pathway can be simulated. In general, they find that conformational fluctuations do not enhance the chemical reaction rate in this system. I have two main concerns about the science that was performed here. The first is that the energy barriers in the long-timescale experiment appear to be improperly paramaterized. In estimating these barriers for the phosphotransfer reaction in Adk, Pisliakov et al. used 260 /s as kchem. However, although the actual reaction carried out by Adk follows an extremely complex scheme, the analysis performed by Wolf-Watz et al. utilized a simplified scheme that combined all post-association steps into a single kcat. This is why the concordance between kcat and kopen justifies the conclusion that lid-opening is rate-limiting. In principle, the experiments used for that paper are incapable of separating the opening and closing steps from the chemical step. Therefore we have no experimental knowledge of the phosphotransfer rate, except that it is greater than 260 /s. This perplexing error appears to have originated with Min et al., but I am surprised Warshel’s group did not catch it. This is not a major problem because the bulk of the conclusions of the experiment were drawn from a different simulation in which the energy barriers were lower, but this leads to my second concern. If the structural transition involves a very smooth and coherent rearrangement of the protein, then simply manipulating energy barriers should not result in a serious error of analysis. In reality, however, ensemble motions of protein elements are not going to be so directed or uniform. Structural rearrangements are not highly singular steps, but involve a large number of intermediates and transition states. Motions in the late stages of the structural transition that promote catalysis may well be missed by simplified models, or accelerated beyond productivity by lowering the energy barrier. That said, I’m not particularly surprised that Pisliakov et al. find that energy from the conformational coordinate does not transfer to the chemical coordinate, nor do I disagree with the finding. Despite what Pisliakov et al. appear to believe, the papers that have come out of Dorothee’s group don’t argue that the millisecond motions contribute directly to the chemistry. Doro doesn’t believe that for a second. Neither do I. The importance of dynamics has little to do with shoving the reaction along the chemistry coordinate, but everything to do with getting substrates bound and into a state where chemistry is possible. Dynamics allow an enzyme to reconcile incompatible functional requirements. To efficiently function as a phosphotransfer enzyme (as opposed to a hydrolytic phosphatase), Adk must expel water from the active site during catalysis. If the active site is inaccessible to solution, however, there is no way for the substrates to diffuse into it. It is difficult to create a single, rigid fold that can accommodate both these demands, but by fluctuating between two states the problem is resolved quite easily. So yes, the dynamics are essential to catalysis, but that does not imply that the conformational and chemical energy coordinates are coupled. More perplexing is the discussion of the hierarchy of motion, which Pisliakov et al. take to mean that nanosecond motions somehow contribute to the chemical coordinate. As I discussed when that paper was initially published, the question being addressed was whether and how motions on the fast timescale (ps-ns) in Adk were related to the slower (ms) motions of the lids. In a hierarchy of motion, fast timescale fluctuations enable or promote slow timescale dynamics. In the case of Adk, this means that nanosecond flexibility at structural hinges allow the millisecond motions of the ATP and AMP lids. It was not implied, then or since, that the nanosecond motions in question make a direct contribution to movement along the chemical coordinate. This is not to say that there are no researchers who believe that ns motions contribute to catalysis — I’ve previously mentioned some work on hydrogen tunneling that makes precisely this argument. In the specific case of Adk, however, the contribution of ns motions to catalysis consists entirely in their enabling of the slower ensemble motions of the nucleotide binding domains, and nobody but the Warshel group has suggested otherwise. There is an ongoing disconnect in the literature concerning the role of dynamics in catalysis. While it is true that in many cases rates of structural transitions correlate with rates of catalysis, this does not imply that the conformational transition coordinate is linked to the chemical reaction coordinate by direct transfer of energy. It is more likely that the dynamics of the enzyme contribute to catalysis by generating reaction-competent states from reaction-incompetent states. This is not to say that dynamics cannot possibly make a contribution to phenomena such as hydrogen tunneling, but it strikes me as unlikely that motions on the millisecond timescale will contribute to a chemical coordinate. Experiments, rather than simulations, will be the ultimate test of the idea. However, in principle, this hypothesis can only be tested experimentally on enzymes where the conformational changes do not limit the chemical reaction rate. Because the rate of the chemical step is unknown in Adk, it may not be an appropriate model system for addressing this question. Well, the papers for which Ming produced his fantastic molecular artwork came out in Nature last week. There were two, as some of you might have noticed. Although the larger paper was probably more technically impressive, I’m going to skip over it and talk about the second Henzler-Wildman et al. In the interest of full disclosure, I will point out that although I did not work on this paper, those who did are in my lab. So, either I am a homer or this stuff is so exciting that I still want to write about it even after hearing it rehashed endlessly for more than a year. The question at hand is the nature of protein conformational changes. Specifically, the paper is meant to address whether motions on the timescale of nanoseconds to picoseconds are indicators of slower motions, and if so, what kind of indicators they are. I don’t mean to set up a false dichotomy here, but in order to set up this discussion it’s most convenient to describe two extremes of an expected spectrum of behaviors. At one extreme of the spectrum we have a sort of “ball-and-string” model of protein behavior, in which slow motions generally reflect coherent motions of larger structural units with intervening regions of flexibility serving as “hinges”. This would tend to produce the energy landscape shown at left, with two minima separated by a single large energy barrier, with perhaps a very low population of an intermediate state. Such a model predicts true two-state behavior in the slow time regime. On the fast timescale, dynamic behavior will be heterogeneous, with residues in the “ball” showing rigidity while residues in the “strings” are flexible. As an alternative extreme, one could imagine a “jello” model of protein dynamics. In this model, domains or subdomains “wiggle” into new positions primarily through incoherent motions that occasionally produce a coherent shift. Thus, two well-populated minima might be separated by several intermediates with relatively low energy barriers (example energy diagram at right). If this is the case, one would expect the behavior in the slow time regime to be less clearly two-state (because the intermediates are all populated) and for the fast timescale dynamics to be fairly homogeneous and reflect significant flexibility. In the ball-and-string case the transition rate is governed by a monolithic energy barrier, while in the “jello” case the transition rate is limited by frustration. I want to re-emphasize that this is not an either-or proposition. It is likely that both extremes are present in nature. Also, the ball-and-string extreme is really just a special case of the jello view. So what this paper cannot do is establish “how proteins move”. However, it can establish how a particular protein moves and also indicate what techniques to apply to answer the same question in other cases. The particular protein being studied in this paper is adenylate kinase, which I will refer to as Adk, a highly conserved protein that is present in nearly all forms of life. Its function is to convert one ATP and one AMP molecule into two ADP molecules and vice versa. Adk has two interesting properties. The first is that it is an equilibrium enzyme, which is to say that it catalyzes the phosphotransfer equally well in both directions. This is a useful feature to have in NMR studies. Additionally, although it is highly conserved, the slight differences in sequence between Adk from the intestinal bacterium E. coli (mesoAdk) and the hyperthermophile A. aeolicus (thermoAdk) produce enzymes that have very different thermal stabilities and activities. Adk is a single fold with three subdomains: a “core” and two “lids”, one of which typically binds AMP and the other ATP. It has previously been shown that the opening of these lids is the rate-limiting step of Adk catalysis, for both mesoAdk and thermoAdk. More recent research, published in a separate letter to Nature last week, indicates that these lids open and close even when the substrates are not present. The question then is whether the motion of the lids more closely resembles the ball-and-string model or the jello model. Henzler-Wildman et al. modeled thermoAdk and mesoAdk fast-timescale dynamics in order to resolve the question. I have shamelessly stolen their first figure for your benefit. 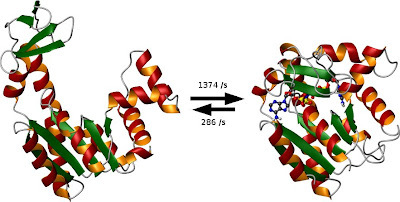 The order parameter S2 is shown on the structure of mesoAdk (A) and thermoAdk (B). Both datasets were taken at 20 °C, a temperature at which mesoAdk is very active and thermoAdk is not. 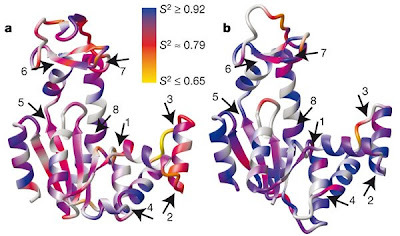 Just to orient the non-NMR people, for a structured protein one expects most of the bond vectors to have order parameters between 0.8 and 0.9, so even the red residues in these structures are not really all that unusually flexible. Also note that the AMP lid is located at the right end of these structures (folding over at hinges 1-4) while the ATP lid is at the top (hinges 5-8). It should be immediately apparent that thermoAdk is more rigid than mesoAdk. A more subtle point is that many of the “hinges” identified from crystal structures have increased flexibility relative to their surroundings. Also, although the lids (especially the ATP lid) are more dynamic than the core, they retain order parameters characteristic of folded proteins. This is in contrast to earlier research from the Meirovitch lab, which indicated substantial nanosecond flexibility in the ATP and AMP lids (LID and AMPbD in their description). The supplementary information for Henzler-Wildman et al. is freely available and contains a good discussion of the discrepancy. For those who find it too technical, it can be summed up as follows: the Meirovitch group improperly applied an isotropic global rotational diffusion model, and their SRLS results produce order parameters that are inconsistent with the domains being folded. Moreover, the correlation times they derive with their method appear to be too close together to be reliably distinguished with the NMR data they collected. The Henzler-Wildman results are consistent with the previous relaxation dispersion data for Adk and also with molecular dynamics simulations (contained in the paper). If Katie reads this, perhaps she can elaborate on the reasons why her data is superior. Commentary from the Meirovitch group is also welcome. Let us will continue on with the paper. As I mentioned, there is a bit of MD in there which supports the NMR findings. What I found to be more interesting, however, was the way that the dynamics of thermoAdk reacted to temperature. Because thermoAdk melts at a very high temperature, it was possible to measure its dynamics all the way up to 80 °C, although glycerol had to be added to the solution at this temperature in order to bring the tumbling rate back down to a point where internal and global correlation times could be reliably separated. The results, which you will have to read the paper to see because I forgot to email myself the figure from work, indicate that as the temperature increases the order parameters decrease (expected) and become very similar to those of mesoAdk at 20 °C. This matches up nicely with the results of activity studies which indicate that the activity of thermoAdk at the high temperature is similar to that of mesoAdk at the low temperature. Because it is known that the lid opening is rate-limiting, and because local deformations at the hinges are required for the lids to open, it is likely that the increased fast-timescale flexibility of thermoAdk hinges at high temperature is directly related to the increased activity of the enzyme at that temperature. The dynamic results in this paper seem to support the ball-and-string view of motions in Adk (by contrast, the Meirovitch results would suggest the jello view). Although the lids are not as rigid generally as the core, their order parameters are still within a reasonable range for a folded protein, and are for the most part higher than the order parameters of residues located at reasonably well-defined hinges. In Adk, motions on the μs-ms timescale appear to be enabled by flexible hotspots that lie between well-defined elements of tertiary structure, with the overall ensemble dominated by the two discrete endpoints. For this case and others like it, a combination of relaxation dispersion measurements and model-free analysis suffice to characterize the motions. For cases which more closely match the jello view, many NMR approaches may prove difficult to implement. Relaxation-dispersion analysis of such motions is likely to be frustrated by endpoints that constitute a slim majority or plurality of the ensemble, high rates of interconversion between similar conformers, and possibly a low Δδ for these conformers. Fast-timescale studies will be difficult because the motions involved will be complex and may violate some model-free assumptions. In such cases, high-field measurements of R1 dispersion (yes, I said it) may prove especially valuable as the dominance of ωN in those measurements at least gives us a chance of distinguishing motions in the high-ns regime. Of course, the major difficulty for NMR will be if the jello motions result in intermediate exchange and excessive signal averaging — in these cases paramagnetic spin labeling or EPR studies may prove to be the only practical method. Henzler-Wildman, K.A., Lei, M., Thai, V., Kerns, S.J., Karplus, M., Kern, D. “A Hierarchy of Timescales in Protein Dynamics is Linked to Enzyme Catalysis” Nature 450 (2007) p913-916.